Tuesday afternoon at the Delaware County Fair was humid and cloudy with spells of light drizzle. One place to dodge the drops was the Gazette Junior Fair Building, where all the 4-H students’ project boards, exhibits, and samples are displayed. Still Projects may not be the first thing that comes to mind when one thinks of 4-H, but it is a staple of fairs. For Ohio 4-H participants ages 5 to 19, there are 46 projects from A-W (Alpacas to Writing) to try their hands, head, heart, and health at. Whether you own goats or not, you can still do a project book on them. Participants can enter as many categories as they like, but only one entry per category. The project displays are put up, and judged on Sept. 9, a week before the fair actually starts, and ribbons and plaques are placed with the winners. Of the different project categories, Shooting Sports may be the most popular, Tidd said. There was plenty of information provided by students, and even examples of clay shots that had been hit by a participant. Also popular are Natural Resources, Dogs, Scrapbooking, and any type of science. Photography used to be popular, but seems to be dwindling, she said. Some 4-H’ers enter the same categories each year (Junior, Intermediate or Senior level), some like to switch things up each year. There’s always at least one entrant per category, so there’s always a winner. Each participant and project faces an interview judge, who asks them about their project book, and assigns them an A, B, or C. If they’ve gone above and beyond, they get an Outstanding rating, Tidd said. Tidd says the building gets a good amount of traffic, including school groups, parents, and grandparents of 4H’ers, as well as 4H alumni like herself and even home economics teachers. They like seeing the creativity of the kids; what they’ve learned from their project; and the actual fruits of their labors, whether that is flower decorating, table setting, or growing hot peppers. On this particular day, there were also baked goods that were later going to be auctioned off at that night’s Junior Fair Sale. “Be careful putting your hand up” while attending the Junior Sale, Tidd said, or else you might find yourself accidentally buying an expensive baked good. The Big Walnut-Delaware Area Career Center chapter of the Future Farmers of America has a display up at the Delaware County Fair. 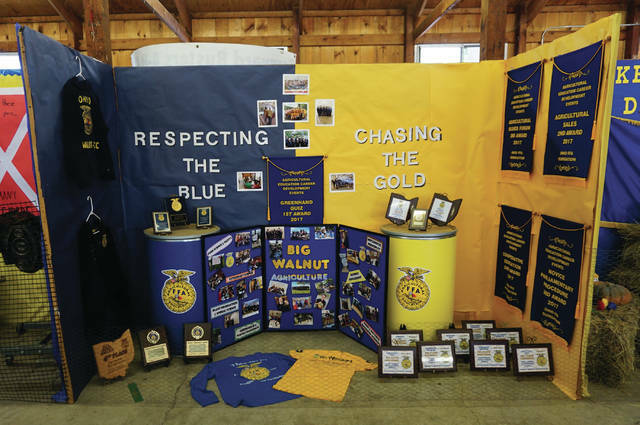 https://www.delgazette.com/wp-content/uploads/sites/40/2017/09/web1_BW-DACC-FFA.jpgThe Big Walnut-Delaware Area Career Center chapter of the Future Farmers of America has a display up at the Delaware County Fair.